Single cut Les Paul Jr - new pickguard! Many years ago I owned a 70s Arbiter single cut Les Paul jr copy (made in Japan I assume), which I for some mysterious reason decided to sell, even though it was a great guitar, and it had cost me almost nothing (and I got almost nothing for it). I've been thinking about that guitar a lot lately, and I've been overcome with GAS. Especially since I have a project where a simple rock machine like that would be perfect. Vintage and custom shop Gibson are out of my budget (which is somewhere around $500-900), and I've been pretty uninspired by the cheaper made in USA versions I've tried ('faded' and whatnot), plus I'd really prefer sunburst one. I've been looking at the Tokai LSJ-80 and the Japanese Epiphone LQ version (which might be the strongest contender right now). Are there any other ones I should be looking out for? Re: Single cut Les Paul Jr copies? If in the style of is close enough there are the way fun old Silvertone Jupiter/1420/23 sorts. I would probably go with the Epiphone if I wanted a more proper Jr, they are fun guitars! Beat to hell old single cut Melody Makers can still be found in that price range. How about the Univox Les Paul Junior? I've never played one, but they look pretty decent! What about an old (80's) Gordon Smith? You'd most likely have to put in a bucker size P90 because that's how they came and the double cuts (like the one Robin Guthrie had in the early 80's) are more common but I bet you could get one with patience well within your budget. I've always quite liked how 'no image whatsoever' the more basic GS's were. Yeah, I'm pretty set on a 'proper' Jr, but I've always had a soft spot for Melody Makers. 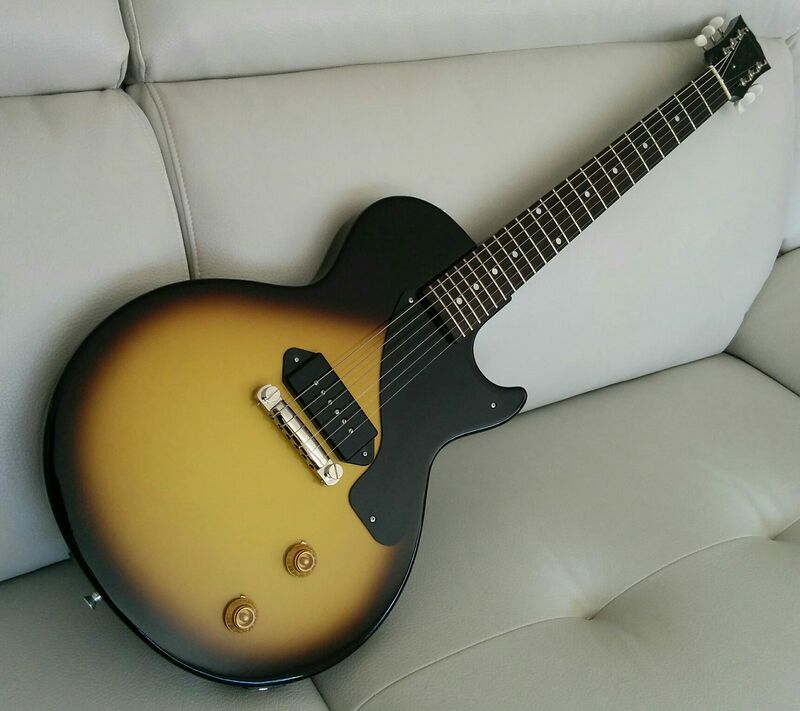 And I actually preferred the LP style Melody Maker from around 2010 over the LP Jr from the same time. All the ones I played just seemed more well put together than the faded Jrs and Specials. I hadn't heard of Gordon Smith before, thanks for the tip! I got terrible GAS for a Godin Summit SG P90. It's a 2018 model, and Godin makes great quality for rather small money. It's all made in Canada. I had a (modern) Gordon Smith that had been custom ordered with vintage Les Paul Jr. specs, including P90. It was a great guitar. It's possible that Univox only ever made double cuts. I kind of just assumed they made single cuts as well. I know we both like Univox guitars, so I figured I'd mention it! In the UK there was also a realy good arbiter copy but they mostly seem to be double cutaway. I agree that the single cuts are better guitars; just a bit more solid and chunky. I don't know how they play, but there are some good looking recent Gibson single cut melody makers. This guy sure seems to enjoy his (bit of an understatement ), and it looks cool with the P90s. I like the type of sunburst they did on these, much nicer than the sunburst Juniors (apart from the CS ones). Would you consider the Trevor Wilkinson-designed Vintage brand? The V120s/V130s shown here are cheap, cheerful, and well-made by all accounts. The sonic blue V120 looks nicer than the sunburst one to me. Plenty to be had 2nd-hand for even less money, I'd assume, maybe in other finishes and variations on the same theme. That said, a Gordon Smith is a great idea too, though their finishes are generally pretty uninspiring. I saw those yesterday, but there's something about the shape that bothers me. I've played a couple of Vintage guitars before, they were pretty decent guitars. They seem to have changed the shapes of their SG models though, they used to be more faithful to the real deal (C&D-letter from Gibson perhaps). So maybe the older Jrs are more correct too. I'll have to investigate. The AXL Bulldog looks interesting, but I’ve never tried one. What about an MIJ Epiphone? Not sure they have sunburst but they are very good guitars.